Point of No Return is een web log over de veelal vergeten Joodse vluchtelingen uit de Arabische wereld en Iran, die niet allemaal ineens vluchtten in 1948, zoals soms foutief voorgesteld, maar in de loop van enkele decennia hun vaderland ontvluchten voor geweld, onderdrukking en discriminatie, of soms letterlijk over de grens werden gezet, al hun bezittingen achterlatend en op zoek moesten naar een nieuw vaderland, in Israel, Amerika of Europa. Het schijnt in totaal om 800 duizend tot 1 miljoen mensen te gaan, meer dan de oorspronkelijke Palestijnse vluchtelingen dus. Hieronder reageert Bataween van Point of No Return op de recente verdraaiingen van PLO voorman en Palestijns onderhandelaar Saeb Erekat in The Guardian. 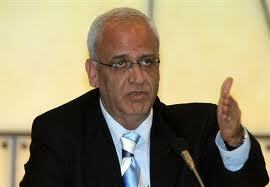 Saeb Erekat, where have you been? We have missed your jovial, suntanned, American-accented appearances on TV. Was your finest hour not during the second intifada, when you claimed that 500 Palestinians had been massacred in the Israeli assault on Jenin in 2002? It was then you cemented your reputation for being 'economical with the truth'. So welcome back, Saeb. I see your latest article for CiF, on Dec. 10th, marks the 62nd anniversary of the passing of UN Resolution 194, which you misinterpret as promoting the 'right' of return of the Palestinian Arabs displaced during Israel's war of independence. There is no such right. True to form, you are back with a whole new set of half-truths and omissions. UN General Assembly resolution 194 calls for Palestinians to return to their homes. This General Assembly resolution was non-binding, unlike Security Council resolutions such as UN resolution 242. In fact all 15 paragraphs were a blueprint for a truce. Only article 11 of Resolution 194 deals with refugees, and does not specify 'Palestinian' refugees. The resolution was equally designed to apply to the Jews expelled from their homes in Jerusalem, Gush Etzion and other regions overrun by the Jordanian Arab Legion in the course of the war. It could also have applied to the thousands of Jews already fleeing pogroms in Arab countries. More about these later. Erekat omits one other crucial piece of wording: Those refugees wishing to return to their homes must agree to 'live in peace with their neighbors': one surmises that even the drafters of UN resolution 194 would balk at the re-admission of a hostile irredentist population. Article 11 also states that those who do not wish to return would receive compensation from governments and authorities. The plural wording includes Arab governments. Sixty two years will have passed without this historic resolution being implemented despite being upheld by the UN with nearly universal consensus. It would surely embarrass our friend Erekat to admit that the resolution fell short of universal consensus because Egypt, Syria, Lebanon, Iraqi, Saudi Arabia and Yemen themselves voted against UN resolution 194. Those Jews driven out of the prospective Palestinian Arab state and from Jerusalem were also deemed refugees, worthy of compensation. The Arabs did not relish their burden of responsibility for them. The Arab states also feared that voting in favour of the UN resolution would confer recognition on Israel as a Jewish state. Not a lot seems to have changed in sixty-two years. Last week on November 27, the Fatah Revolutionary Council (remember, they are the moderate Palestinians) concluded its fifth convention with a declaration refusing to recognize Israel as a Jewish state. Palestinian displacement continues to this day. It is not politic for Erekat to mention that Israel did make a substantial repatriation offer during the 1948 negotiations. The government said it would accept 100,000 refugees in a general settlement. This offer the Arab states rejected. Israel bears responsibility for the creation of the Arab refugees. A moot point, at best. The Arabs rejected the plan to partition Palestine into a Jewish and an Arab state - UN Resolution 181 of 29 November 1947. The Arab refugees were a by-product of the Arab decision to go to war: five Arab armies invaded the newborn state of Israel as soon as it was declared. The Naqba is the catastrophic failure to win that war. The Zionists did not require the expulsion of the Arabs, as the Jewish state allocated by the Partition Plan would already have had a slight Jewish majority. The war saw only a few proven cases of expulsion, notably in Lydda. Most of the land which was to become Israel was state or miri land. The Palestinians did not own '90 percent ' of the land. Today Palestinian refugees number more than 7 million people. It is a curious phenomenon that a baby born in a 'Palestinian refugee camp' (actually a permanent township) in Lebanon is entitled to call himself a refugee without ever having been to Palestine. Unique among refugees, four generations of Palestinians have been living off international largess as clients of the UN agency dedicated exclusively to their needs, UNWRA. After a succession of little lies, Erekat's biggest lie is by omission: More Jews were driven out of Arab countries than the original 700,000 Palestinians who left Israel. They lost fifty percent more in assets. By December 1947, a year before the passing of resolution 194, crowds in Bahrain began looting Jewish homes and shops and destroyed the synagogue. Two were killed. In Aleppo, Syria, the Jewish community was devastated by rioting: at least 150 homes, 50 shops, all 18 synagogues, five schools, an orphanage and a youth club were destroyed. Many Jews were killed, although the exact figure is not known. Over half the city's 10,000 Jews fled. In riots in Aden, 82 Jews were killed and hundreds of Jewish-owned shops destroyed. In Libya, 4,000 Jews had been made homeless by rioting two years earlier in which 130 Jews were murdered. In the summer of 1948, hundreds of Jewish civilians were murdered in Egypt and 48 in Morocco. Before a single Palestinian had been made a refugee the same Arab states which embarked on war against Israel had declared a war against their own innocent Jewish citizens living hundreds of miles away from the battlefield. Even The Guardian (yes, you read that right), in an editorial in December 1947 entitled 'Hostages', deplored inflammatory statements made by Arab leaders and threats against their Jewish minorities. Without playing down the suffering of Palestinian refugees, it is important to note that they were, unlike Jews in Arab lands, victims of war, not ethnic cleansing. The proof is that 160,000 Arabs remained in Israel, and over a million live there today, while 0.5 percent of the 1948 Jewish population remain in Arab countries. The Palestine Post of 22 December 1947 carried a report about harsh measures that the Arab League was planning against Jews in Arab lands. These Nuremberg-style measures, aspects of which were adopted by individual states, would first denaturalise the Jews, confiscate their property, freeze their bank accounts and treat them as enemy aliens. " It is significant and tragic that such a document should have been drafted," the editorial lamented. "It is easy for them to play the bully and to keep a sword hanging over the heads of many hundreds of thousands of Jews who are at their mercy." As soon as they could, three-quarters of the million Jews living in Arab countries sought refuge in Israel, which absorbed them at great cost. A number of Jewish refugees from Arab countries roughly equal to the Palestinian refugees (two-thirds of whom were internally displaced within historic Palestine) exchanged places. Such exchanges of populations occurred after the wars between Greece and Turkey and India and Pakistan. To achieve a lasting peace settlement based on justice, one cannot acknowledge a one-sided 'right of return' for Arab refugees to Israel if a similar right is not granted to Jewish refugees from Arab countries. There's the rub. The Jews, now fully fledged citizens living in freedom in Israel and the West, do not want to return to the countries which persecuted and ethnically cleansed them. They want only compensation for lost property and human rights abuses. Whatever Erekat may say, there is no precedent for a return of refugees of any sort after sixty-two years. Far better to admit the de-facto exchange of refugee populations; far more humanitarian for the Palestinian refugees in the Arab world to be granted compensation for their losses and the civil rights their host Arab countries currently deny them. Saeb Erekat's argument, echoed by Mahmoud Abbas, makes it plain as day that in spite of western and Obaman efforts to blame settlements or the absence of a Palestinian state for the absence of peace, the Palestinians will not end the conflict unless Israel consents to become a 23rd Arab-Muslim state by opening the floodgates to seven million so-called refugees. Sixty-two years on, the Arabs still view the ideological crux of the Arab-Israeli conflict as the 'right of return' of the Arab refugees. On this matter at least, we should commend Saeb Erekat and the Palestinian leadership for their candour.